For the following pledges, you can add all the extensions! (yes, WW2, because another version of history is growing, but do not cross your bridges before you get to them). 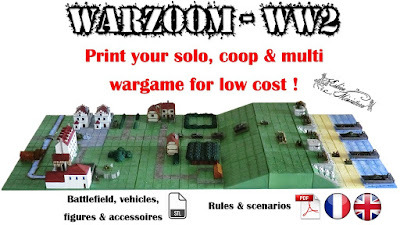 Warzoom - WW2 is a strategy game with figurines where the playing field consists of grid tiles with scenery. The objective alone or in cooperation is to succeed a scenario, or to chain them to succeed a campaign. The objective in 1vs1 or 2vs2 is to control a maximum of a normal rate. Playable in Solo, in cooperation (against the game) or in multiplayer (1 vs 1 or 2 vs 2). At an adequate scale for easy storage, playable anywhere. Here, the 10mm. Everyone must be able to print their game in 3D! And in the future, that the game is followed by new extensions ... There will be at least 2 in the goal stretch if the project works! Offers many videos to understand the rules, simple goal and strategic surprises. The files are specially designed to be easily printed by ALL 3D printers on the market. Always with the love of having a compromise between final quality, ease and solidity. Even on printers with a small tray of 15x15cm! Regarding the tiles, there are currently more than 30, and it's growing. Each one to enlarge your game table, and some adapt to one or more scenarios. For figurines, it is important to note that on this scale they are "generic". Let's be honest, the engraving is not as good as 10mm figurines that you can find in metal figurine makers. But here, the goal is to make a complete game allowing anyone to produce at home, at will, for a very low cost! About vehicles, honestly engraving is almost as good or better than for manufacturers! My desire is here to help you make the world a better place to play. And many other complementary plans are planned for the future if this project is a success. If you are pledger is that you have a (prices start at 150 €, it's time to start!). Know that a complete set is printed roughly in 100 hours, for about ten trays of different impressions. You will be able to print more than 1 soldier of PLA! the technique is moving quickly, maybe the printer I will take care to adapt to the budget of the 3D printer. Since the technique is moving quickly, maybe the printer that I will deliver you will not be the one announced. I will take care to adapt the budget of the 3D printer when I order them so that you have the best for the same price and tested and approved by myself. (yes, WW2, because another version in another period of history is growing, but every thing in its time). 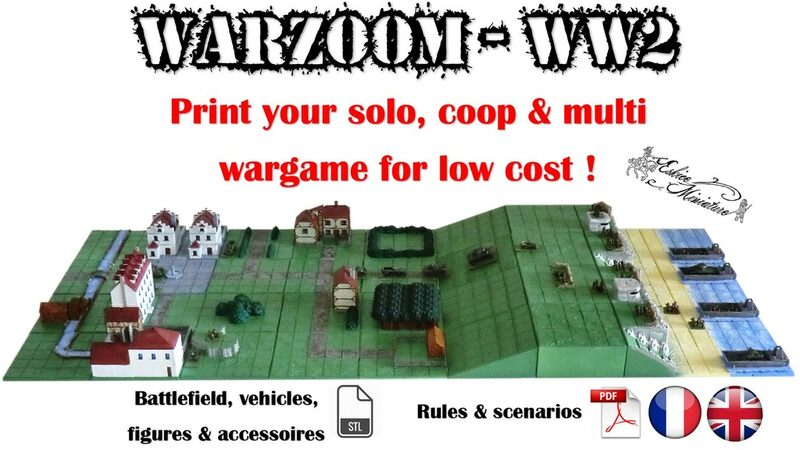 Warzoom - WW2 is a strategy game with figurines where the playing field consists of grid tiles with decorations. The objective alone or in cooperation is to succeed a scenario, or to chain them to succeed a campaign. The objective in 1vs1 or 2vs2 is to control a maximum of tiles at the end of a normal part or to achieve one or objectives. Playable alone, in cooperation (against the game) or in multiplayer (1 against 1). That everything can be printed in 3D by everyone! And in the future, that the game be followed with new extensions ... There will be at least 2 in stretch goal if the project works! Suggest many videos to understand the rules, simple but strategic and full of surprises. The files are specially designed to be easily printable by ALL 3D printers on the market. Always with the aim of having a compromise between final quality, ease and solidity. Even on printers with a small tray of 15x15cm! As for the tiles, there are currently more than 30, and many more are working. Each one to enlarge your game table, and some adapted to one or more scenarios. For figurines, it is important to note that on this scale they are "generic". Let's be honest, the engraving is not as good as 10mm figurines that you can find in metal figurine makers. But here, the goal was to make a complete game allowing anyone to produce his evolutionary game at home, at will, for a ridiculous cost. About vehicles, honestly engraving is almost as good or better than for metal manufacturers! My desire is above all to offer you the 3D files as well as the rule system which is now mature after more than a year of play. And many other complementary plans are planned for the future if this project is a success . If you are pledger, it is that you have a 3D printer or that you plan to buy one (the prices start at 150 €, it's time to start!). Know that a complete set is printed roughly in 100 hours, for about ten trays of different impressions. You will be able to print more than 3 set Soldier complete with a reel of 1kg of PLA! For 3D files, no risk they are ready! And new ones will complete this project if it succeeds. If you pledge for a pack including a 3D printer, I specify again that normally it will be the models announced. But as the technique advances very quickly, it is possible that I change the printer model (the same criteria) to provide you with the most recent model, adapted and tested by me.